The second edition of the Space Exploration Masters, Europe’s first innovation competition dedicated to space exploration, is now open for submissions! The Luxembourg Ministry of the Economy and its SpaceResources.lu initiative again feature a prize in the competition, focused on solutions around the utilization of space resources. The “Space Exploration Masters” competition, launched by AZO on behalf of ESA, is scouting for new business ideas in space exploration that provide major benefits for the global society and the economy. The international competition aims to empower and foster business innovation around space exploration activities in low Earth orbit, the Moon, Mars and beyond, for the benefit of society and humankind. Applications to take part in the competition can be made until 31 July 2018 at www.space-exploration-masters.com. 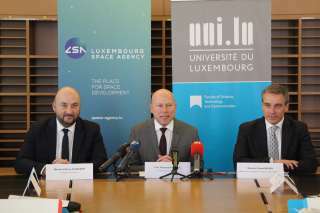 The SpaceResources.lu Challenge is an integral part of the SpaceResources.lu initiative and aims to discover innovative solutions that complement Luxembourg’s growing portfolio of activities in space resources utilization (SRU). Specifically, the Ministry of the Economy is looking to strengthen the country’s expertise in promising areas related to the SRU value chain including, but not limited to, prospection, extraction, processing, manufacturing, and servicing. It is also interested in enabling technologies and fields related to SRU such as materials science, additive manufacturing, remote sensing, communications, robotics, data analytics, and artificial intelligence, but will not consider launch activities.